Melanie, a 3rd grader at Michael Anderson, repeatedly tried to attend ‪#‎RBBB‬ sessions even though she was not a participant in the program, explaining to the Site Leader that she “just wanted to read better too.” After improving her words per minute to 61, she became one word over the threshold for participation! We were thrilled to be able to welcome Melanie this semester so that she too could read better and ‪#‎BeBetter‬! Read Better Be Better is proud to support struggling students like Melanie who want nothing more than to be a better reader. Students unable to read on grade level by 3rd grade are four times less likely to graduate high school by the age of 19 years. To learn more about the impact of literacy skills on academics, visit our 3rd Grade Literacy page. After school programs for RBBB take place in school districts through Arizona. District participation is based on students qualifying for the Free and Reduced Lunch program, and where participants attend schools where the median family income is roughly half the state average. 8th grade at-risk students are paired with 3rd graders who are underperforming in reading comprehension. 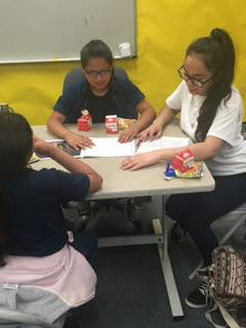 8th grade students, known as ‘Bigs’, are paired with a 3rd grade student, known as ‘Littles’, and are trained to use a simple but effective reading curriculum to improve their Little’s literacy skills. The full ninety minute program includes curriculum and activities curated to increase student’s reading comprehension, focus, concentration, and enjoyment of reading. 85% of 3rd graders report that they understand what they read better by the end of the ten week program than they did at the start of RBBB. To read more, visit our Impact Data page.